This beautiful window has outlived the original frame.It now sit resplendent in a substantial pine frame. BEAUTIFUL LARGE THISTLE IN RICH JEWEL COLOURS Of English origin from around the 1903 mark. 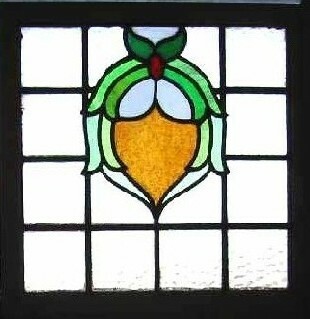 The coloured glass of this window has a rich deep texture. This old heavy glass picks up and softly diffuses the colour of the light falling upon it.The glass has no chips or cracks and the leading is in good order. Frame measures 20"W x 20"H Glass 18" x 18" This Antique Window Shipped and packed to USA for $109 You can buy this now using the paypal link below the photograph or e-mail sales click here to arrange payment by personal check ,money order or bank transfer.